Released: March 21, 2014. Directed by: Neil Burger. Starring: Shailene Woodley, Theo James, Ashley Judd. Runtime: 139 min. Timing’s an important thing to consider when releasing any movie. With Divergent, one must consider if we truly need another post-apocalyptic YA novel adaptation while The Hunger Games still reigns supreme. I think it makes it easier to compare them, even though they’d still be compared if this were released after Hunger Games concludes its franchise. Perhaps by 2015, this wouldn’t be as successful – it seems people are already feeling fatigued from all of these post-apocalyptic young adult novel adaptations. Divergent follows Tris Prior (Shailene Woodley) whose identity crisis begins when she learns she’s a Divergent, which are members of society who don’t fit into the five factions of this dysoptian Chicago. They threaten society because they’re impossible to control. The film is basically about how Tris is going to fit into society, and she has to pick a faction to become a functioning member of society. She chooses Dauntless, and meets her mysterious boy toy Four (Theo James), and together they must find out the secret of Divergent’s before it’s too late. Anyway, the government believes that by dividing people into factions they will be easier to control, because they can only obtain one basic personality trait and do what job best suits them. The government doesn’t allow them to exercise free-will, either. I think it’s better portray all personality traits, but that’s a no-no, apparently. A lot of this film goes against basic human nature, especially the ‘faction before blood’ mindset. Screw that – my family comes first. The film brings about themes of fear, conformity and individuality, and the writers’ thoughts about these themes are mildly intriguing. Divergents are also threatening because, since fear wakes them up, they’re a threat. I like the idea the idea of how one must choose their path at an early age (Tris and her brother choose the same day, so it seems it’s between 18 and 21 years old), no takesies backsies, even if they grow as people and change. (A single drop of their blood drops into the faction bowl of their choosing, so that’s official.) Do you choose to stay in your own faction and stay with your family or part ways? Do you really know your true identity at 18 years old? That’s one of the film’s most fascinating aspects, and the most compelling idea the film has. Though, The Lego Movie is a better exploration of conformity out of 2014 films. I think this would be a good time to get the inevitable comparisons to The Hunger Games out of the way. I think this film’s Divergent member of society is “Hunger Games‘ Mockingjay. Both of these films are essentially about dysoptian futures and overthrowing the government. I think Tris Prior is a more likable protagonist than Katniss Everdeen, but not a stronger character overall. Katniss is great, but too Condor-ish to be completely likable. Then again, that’s the point but it makes it so much greater when she shows her vulnerable side. 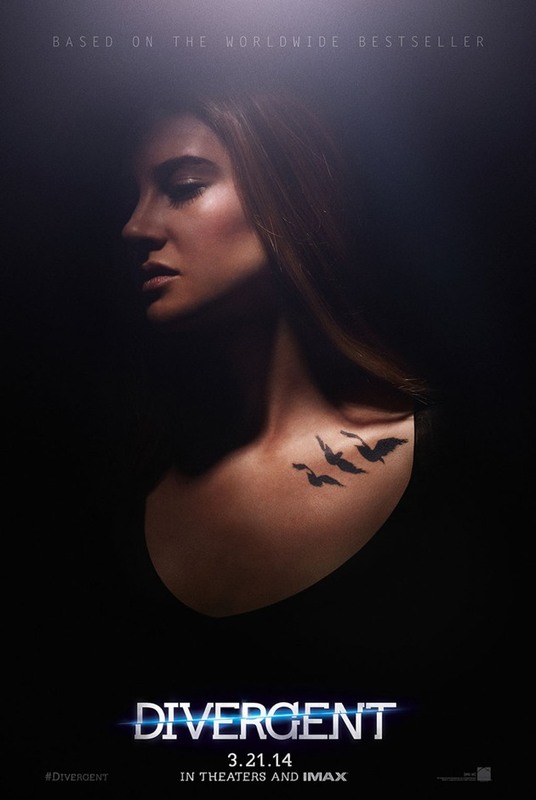 Tris is a good character who stands up for her beliefs and other people, which sometimes brings attention to her when she’s trying to show that she’s someone in society who isn’t hard to control. Woodley portrays her well and heart-warmingly in a few scenes. I think her bravery’s admirable, and I’m curious to see how some of her decisions affect her in the sequels. Woodley, a dynamic actress, has a lot of personality. It seems to me that a challenge for her as an actress would be to be antagonized by a character portrayed by Miles Teller (playing yet another douche), who she has a close friendship with – and was his romantic interest in last year’s “The Spectacular Now.” She seems honestly hurt by some of the things she says, and I like that vulnerability. As for Theo James’ Four, the character is described as “mysterious” but it feels more like “he’s mysterious because he’s under-developed.” James is forgettable in his role, and his character isn’t anything special. I think the chemistry shared between him and Woodley is believable, but he’s not that great. He’s just there because of the way he looks, sorry for being too much of a Condor with that one. Everyone’s pretty well-cast, from Ashley Judd to Ansel Elgort, but it seems that a lot of these actors just have so little screen time, especially Maggie Q who just gives Tris a tattoo and monitors the dream tests. One antagonizing character is Jai Courtney, who just takes pleasure in bossing people around as a trainer in the Dauntless faction, but he’ll get on your nerves after awhile. So much time is spent in training to be a Dauntless that there’s not much time for anything else. This is really just an initiation film to introduce the characters. I assume the fact that they only foreshadow that there’s something lurking outside the city’s walls suggests they will explore it further in the sequels. I think the finale is underwhelming, but Neil Burger (who doesn’t bring much style to the film) really does direct the action-packed finale well. Throughout the film, there are a lot of dream sequences, and there’s a serum that allows one’s images in their head to be portrayed on a monitor; I want that serum, because I’d love to rewatch my dreams. There’s another futuristic invention where it doesn’t hurt to get a tattoo, so since I don’t like pain that’d be nice – I could get the Bugs Bunny tattoo I’ve always wanted. There’s a very fun game of Capture the Flag with guns that simulate the pain of real bullets (it makes me think of that paintball version of CTF in Child’s Play 3) and a crazy zip-lining sequence that enables some great imagery and cinematography to take place. The score also fits the film like a glove. Technically speaking, this all looks great – and it’s epic in scale – but only a stern pretty good in many other aspects.